בחודשים האחרונים הסיפור אודות הסכסוך שנגלע בין חמאמי לבין חרכת אל-שבאב אל-מג'אהדין התפרסם בכלי התקשורת השונים כמו גם במעגלים שונים המסקרים את פעילות התנועה הג'יהאדיסטית בסומליה. הסיקור של הפרשה לפי ההודעה שפורסמה "מזין" את הנרטיב אודות הבדלים אידיאולוגיים בקרב פעילי אל-שבאב. בהודעה נכתב כי על מנת לגדוע את הסאגה ואת ההתעניינות סביב עומר חמאמי והסכסוך עם אל-שבאב, הוחלט לפרסם הודעת הבהרה. בהודעה הוכרז כי חמאמי לא מייצג את תפיסת העולם של אל-שבאב והמג'אהדין בסומליה בשום צורה ואופן. לפי ההודעה של אל-שבאב, הסרטונים וההודעות שפורסמו על ידי חמאמי הם תוצאה של התמרמרות אישית הנובעת מ'מרדף נרקסיסטי אחר פרסום ותהילה'. בהודעה נכתב גם כי בניגוד גמור למה שצוייר באמצעי התקשורת במערב ובעולם, כאילו חמאמי היה אסטרטג גדול ואחראי על גיוס כספים ומתנדבים עבור אל-שבאב - חמאמי אינו ממלא או מילא כל תפקיד בתנועת אל-שבאב ואינו בעל סמכות בתנועה. דיווח לא מאומת: הג'יהאדיסט יליד ארה"ב, עומר חמאמי - חוסל (14 באפריל 2012). In the last few months the story of Abu Mansur Al-Amriki has been playing out in the media circles, not only feeding the narrative of the Western media that deep ideological differences were beginning to devour the Mujahideen in Somalia, but also leaving the Muslim Ummah extraordinarily confounded with a string of video releases that have stimulated a wide range of diverse reactions. 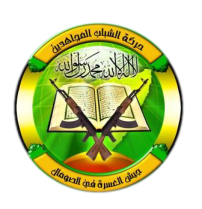 In the light of these events, and for the sake of clarification of the intricacies surrounding the Abu Mansur saga, Harakat Al-Shabaab Al-Mujahideen hereby declares that Abu Mansur Al-Amriki does not, in any way, shape or form, represent the views of the Muhajireen in Somalia. The opinions expressed by Abu Mansur, the alleged frictions and the video releases are merely the results of personal grievances that stem purely from a narcissistic pursuit of fame and are far removed from the reality on the ground. Following the footsteps of the Noble Messenger, Muhammad (may peace and blessings be upon him) and the pious predecessors before them, the Mujahideen remain faithful to the lofty aspirations of their faith, strengthened by the bond of brotherhood, motivated by the rewards of altruistic self-sacrifice for their Muhajireen brothers and their path illuminated by the creed of Al Walaa-Wal-Baraa (Alliance and Enmity). The Jihadi theatre nevertheless accommodates people of all sorts. 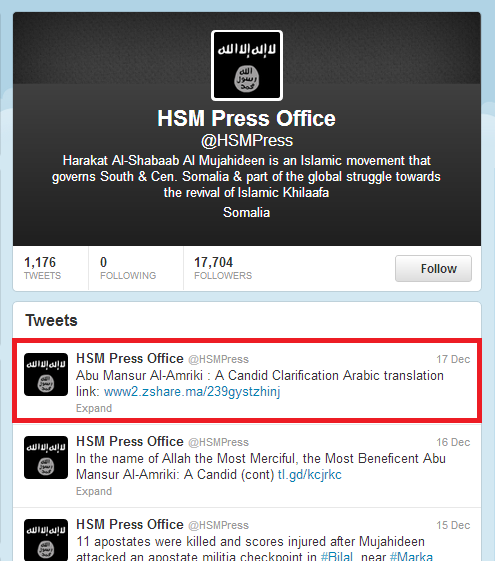 Some, above others, occasionally rise to prominence often with little merit save for their uniqueness, and contrary to portrait of the grand strategist, recruiter and fund-raiser portrayed by the Western media, Abu Mansur Al-Amriki does not hold any position of authority within Harakat Al-Shabaab Al Mujahideen. Despite their fair share of surprise at the turn of events, however, the Mujahideen did not immediately rush to reprimand him, but instead saw it appropriate to lean towards the noble path of the Prophet (peace and blessings be upon him) in resolving the situation: that is Naseeha or giving advice to the brother. To err is human, but Islamic Shari’ah has carved for us a clearly defined path for dealing with disputes should they arise and remedying the mistakes of our fellow Muslim brothers. For months the Mujahideen have been offering advice to Abu Mansur in private, without publicly rebuking him, employing every possible avenue to veil his faults, overlook his shortcomings and conceal the egregious errors he’d committed from the eyes of the Muslim Ummah, in the hope that Allah would guide him and us to the path of righteousness; for it remains obligatory upon the Muslims to offer sound advice to their brothers in religion, in the light of the Qur’an and Sunnah, and guide them towards that which is righteous. It is regrettable, however, that all such efforts have been fruitless despite the numerous attempts. Therefore, when a person rejects the sincere advice of his brothers in private, it becomes religiously and morally incumbent upon the Mujahideen to publicly advise the Muslim Ummah of his obstinacy and insistence on sowing disunity among the vanguards of this Ummah. We sincerely apologise to the Muslim Ummah in general and our Mujahideen brothers in all the fields of Jihad in particular for having to witness such childish petulance in one of the theatres of Jihad, reminding them that the caravan of Jihad cannot and will not, Insha-Allah, be derailed from its tracks or the spirit of this great Ummah dampened by the superficial allegations, frivolous ramblings and whimsical desires of those who wish to enhance their image at the price of Jihad and the Mujahideen, spreading discord and disunity in the process.